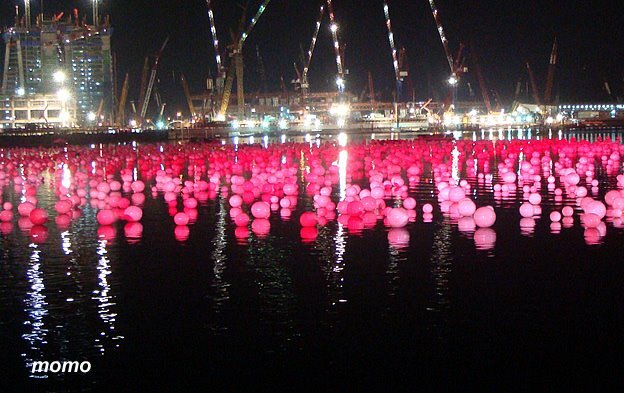 The coloured balls for tonight's New Year's Eve Party. I was here for a wedding last weekend. 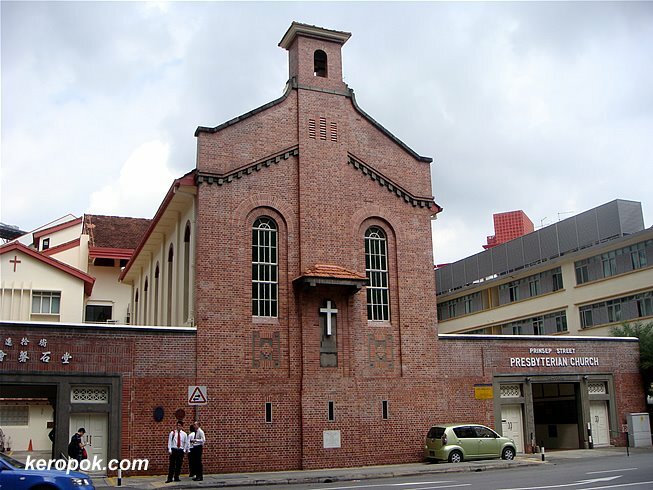 I just read that it's the oldest existing church in Singapore. 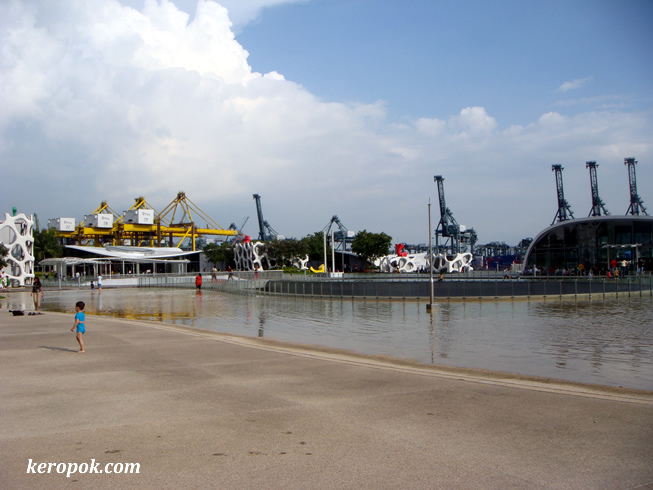 It's also where the Singapore Boys' Brigade was founded. Read more about this building at their church website or Wikipedia. Congratulations CE and G! May the Lord bless you both most bountifully! December's the month of weddings! I looked through the photos I took these few days and saw this. I laughed when I saw this. Just a cheeky post today. I am sure you dig your nose in public too right? 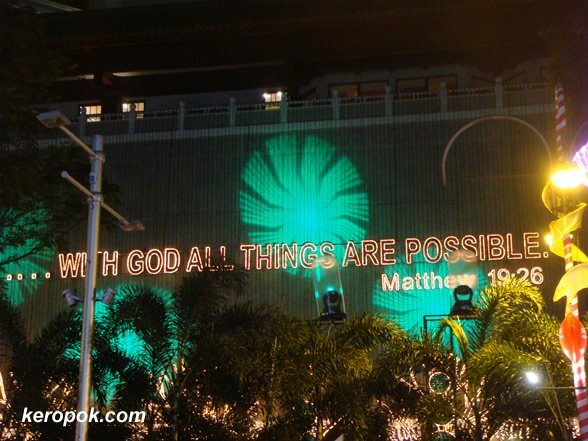 This was yesterday at Orchard Road. 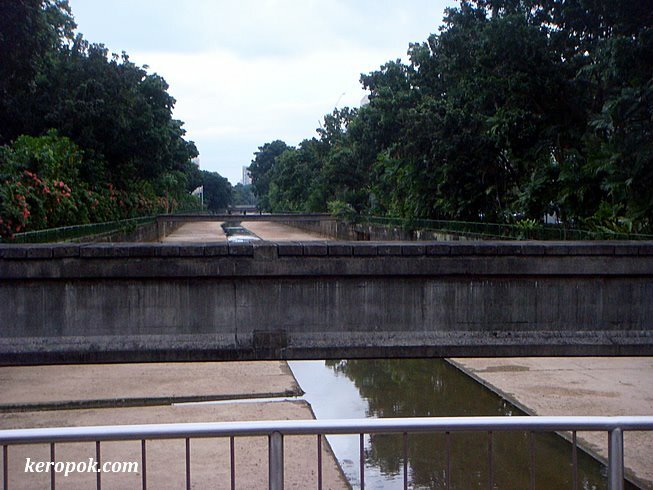 Part of it was closed to traffic and it's a rare opportunity to walk on the roads without vehicles. The malls were packed with people going for post-Christmas bargains. It was madness! The year's almost over. A time where many count their blessings. 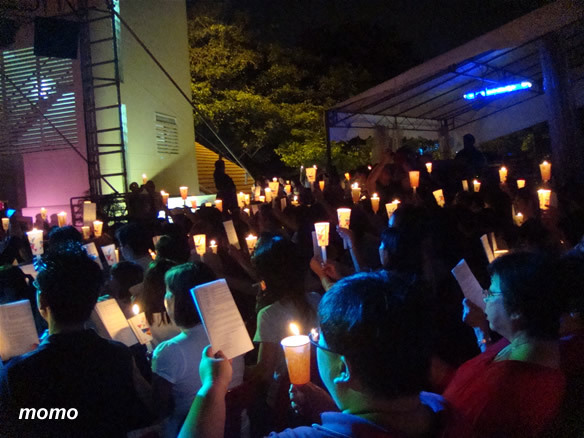 Momo and her parents at the Candlelight Service @ Wesley MC the night before. Tonight we will be at Glory PC's Christmas Eve Concert. Looks like it is really multi-cultural this year. There are also Korean and Japanese community performing too. If you have been curious and wanting to know what Christianity is about, if you find it threatening to walk into a church during normal days, this week is the best to walk in. Grab a friend along and head to a church that's around where you live. 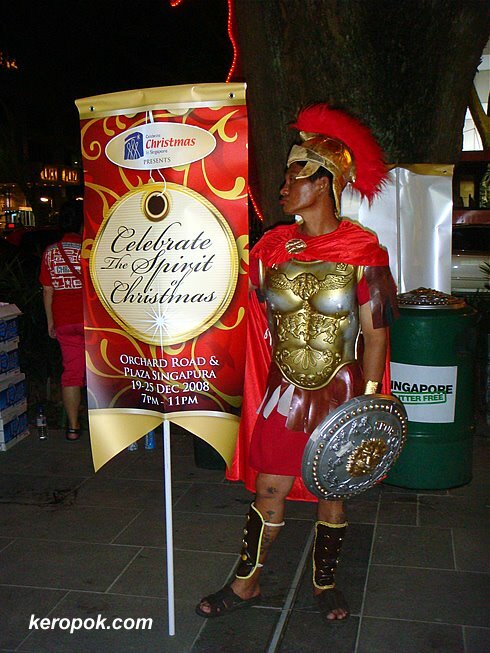 A roman soldier on Orchard Road. He does not look too happy though. He has to work while others are already on long leave? 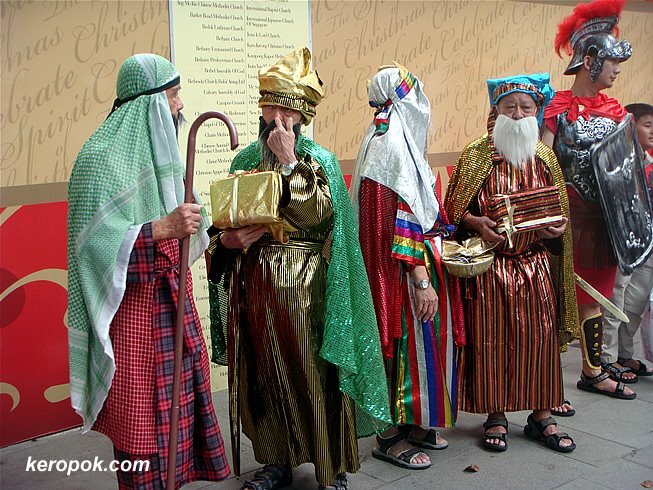 When I saw from afar, I wondered who these people are, dressed up in traditional costumes. 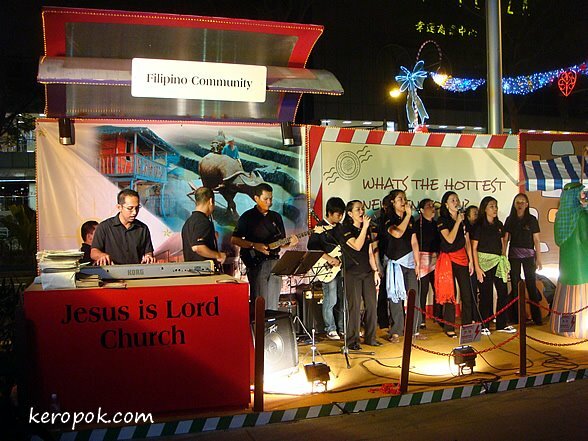 This group is from Indonesia performing at the "Celebrate Christmas in Singapore" event. They belted out Christmas carols with their excellent voices. 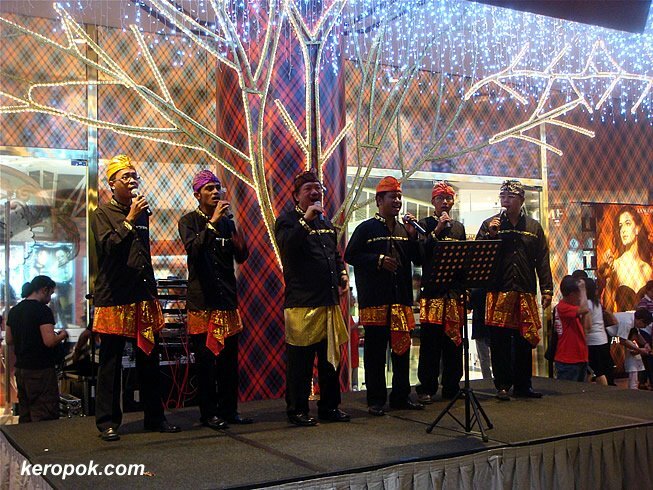 Many group are performing at the stage area set up at Tangs, Tong Building, Paragon, Wisma Atria and Plaza Singapura. 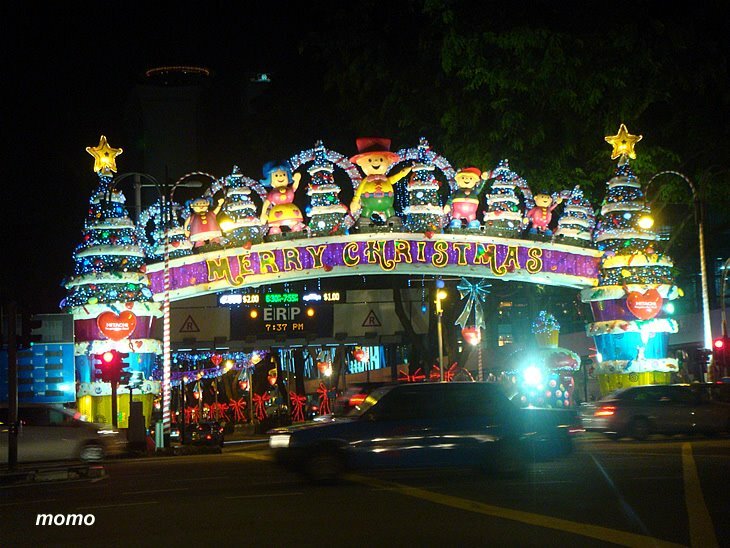 There are also 8 brightly lit floats touring the Singapore heartlands and Orchard Road. 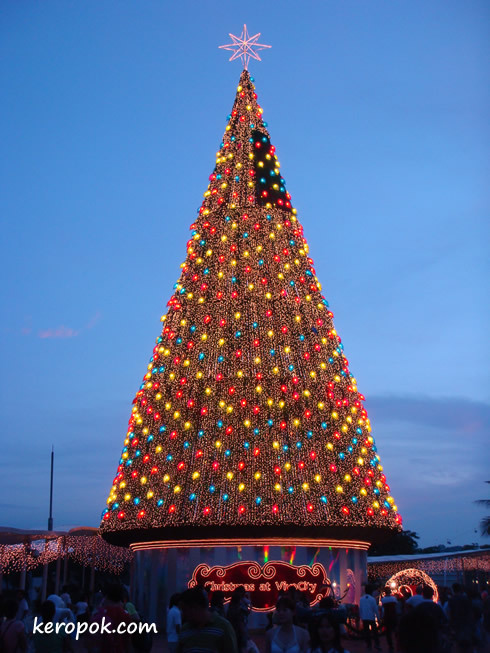 They will spread the joy of Christmas and perform skits, drama plays and choirs singing Christmas carols. 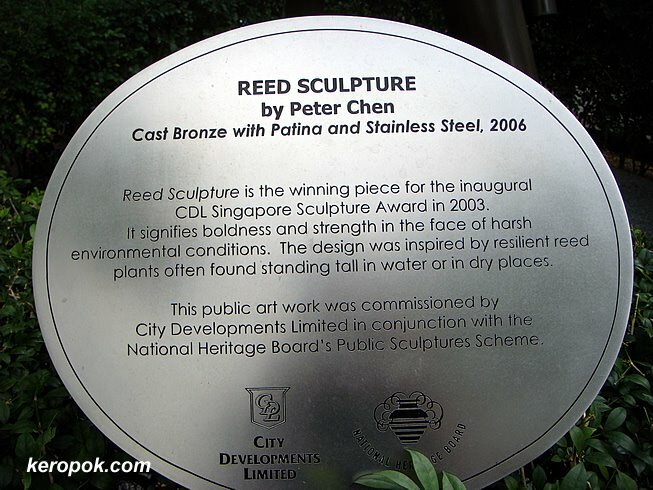 19 Dec - Joo Chiat / Katong area: Odean Katong Front Plaza. 20 Dec - Braddell Heights : Braddell Heights CC Multi-Purpose Court. 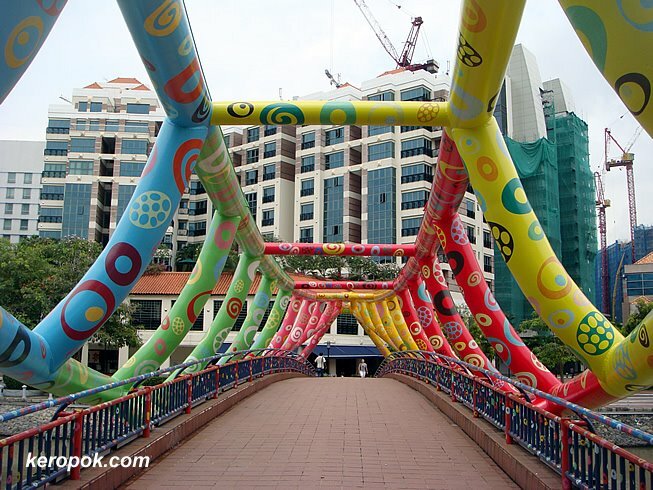 21 Dec - Buona Vista / Holland Village : Amphitheater Blk 2 Holland Avenue. Have a Blessed Christmas. 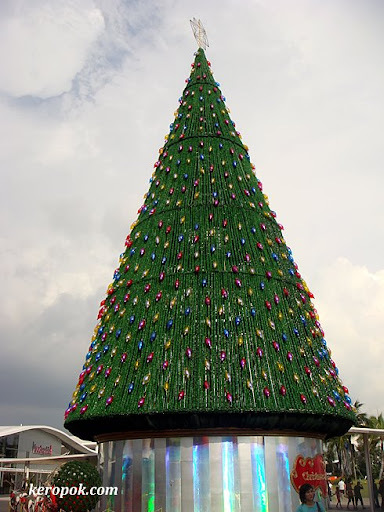 May you find for yourself, the True Meaning of Christmas. Saw this yesterday when colleagues and I went out for lunch. We passed by a park and saw someone sleeping with legs crossed up so high. Everyone sleeps differently. I guess if he's comfy like that it's ok.
Face up, face down or side sleeper? 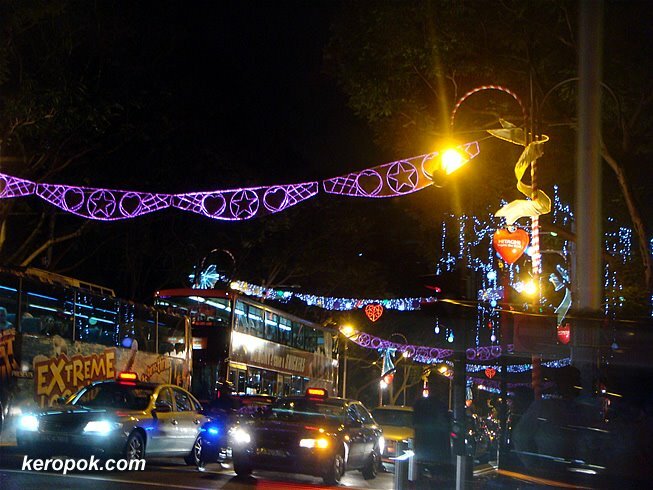 Just passed a tiny bit of Orchard Road after having dinner with friends. Saw the lights, took out the camera and took a picture while on a moving vehicle. 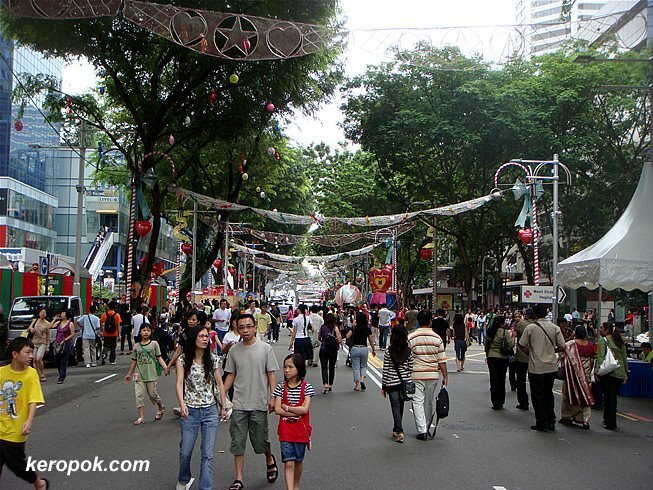 Maybe tomorrow I shall walk along Orchard Road and pick up a few presents. Few days ago, I saw one of the wifi routers around. 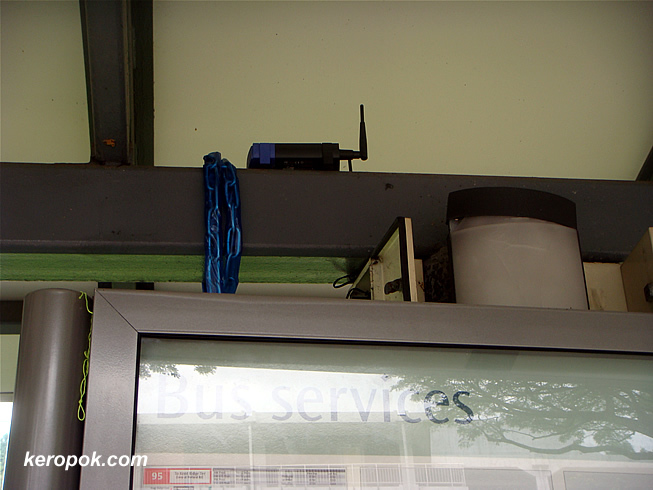 Ah... saw another router hanging at another bus stop. 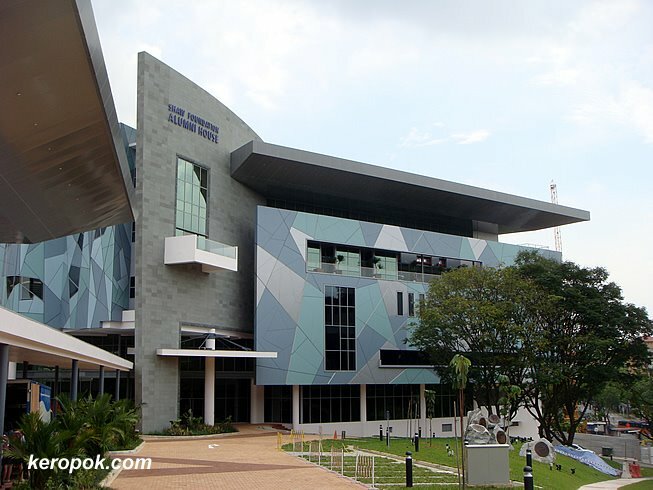 With hints from the notice there, I found out it's the ShuttleNet project by the Communications and Internet Research Lab at the School of Computing, NUS. It's dangling very dangerously isn't it? 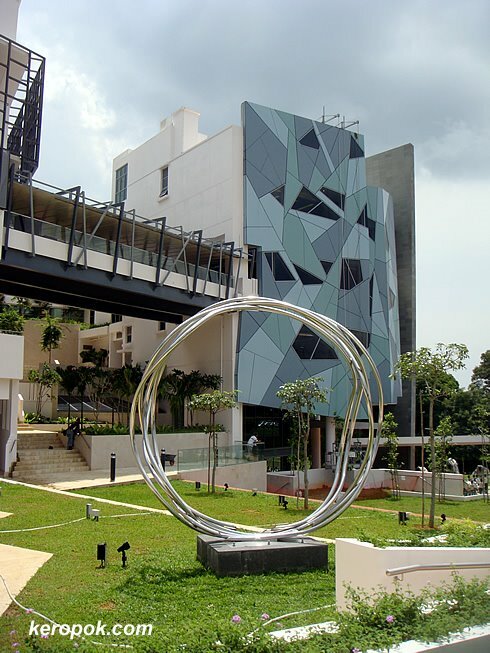 If you are bored and want to find out where the Internal Shuttle Buses in NUS are right now, click here. 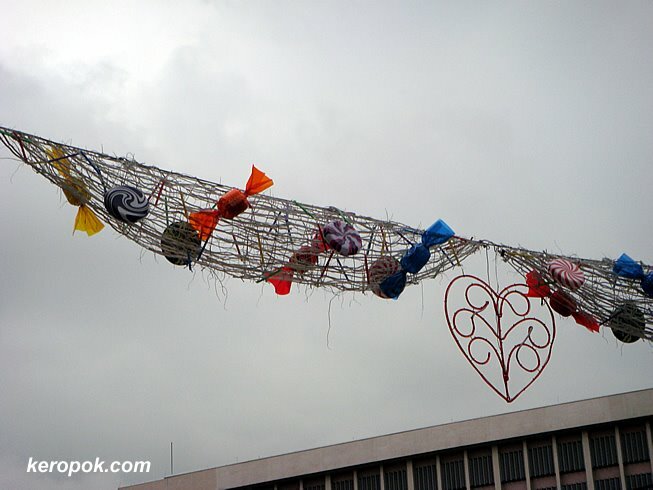 It shows that these dangling stuff works! 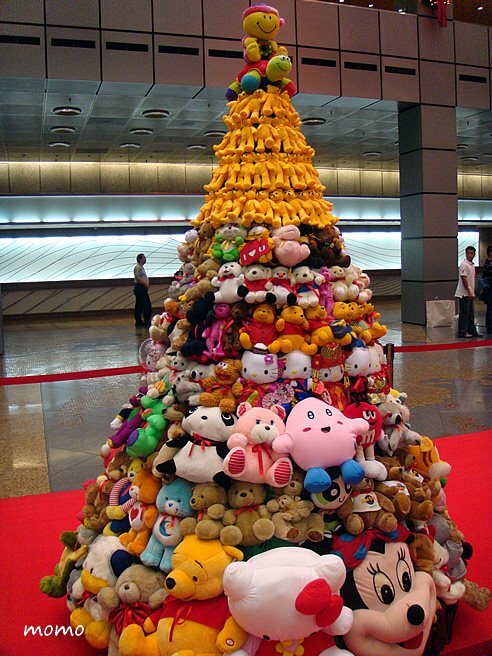 A very unique Christmas Tree. 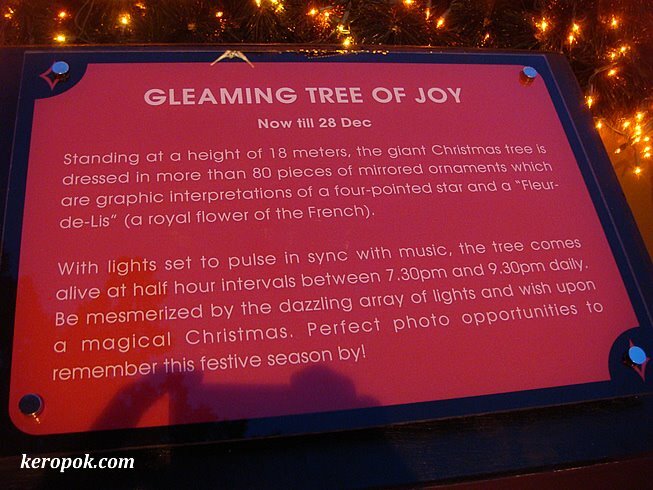 Here's the reason for the unique tree. I seldom get to see this. I am usually at work when the postal ladies come along to deliver posts. Attended a friend who has the nickname Sailorboy's wedding. 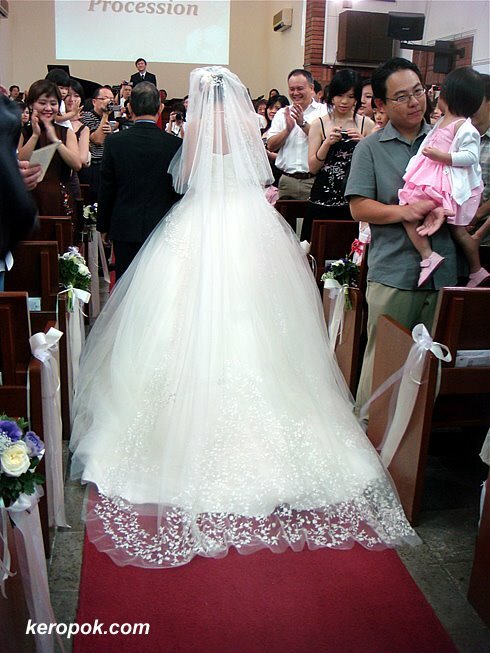 It was such a light-hearted church wedding. We could not believe what they said during their vows! 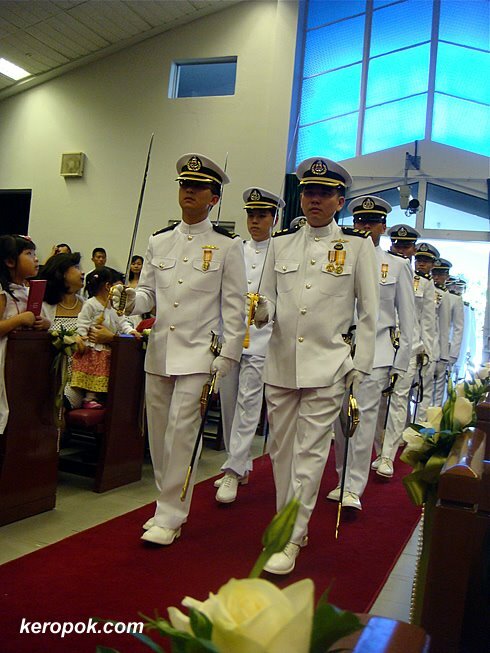 The above is the Sailorboy's mates from the Republic of Singapore Navy giving him the Arch of Swords after they march in. Really really cool! 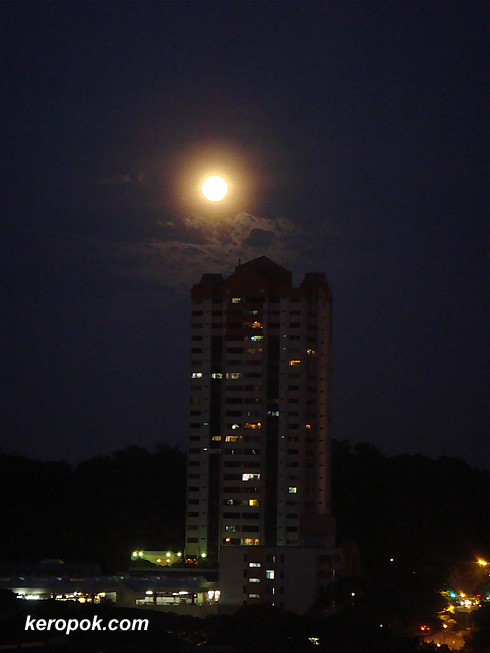 Saw this tonight and took a photo of the bright and round moon. Saw this at a bus stop today in NUS. 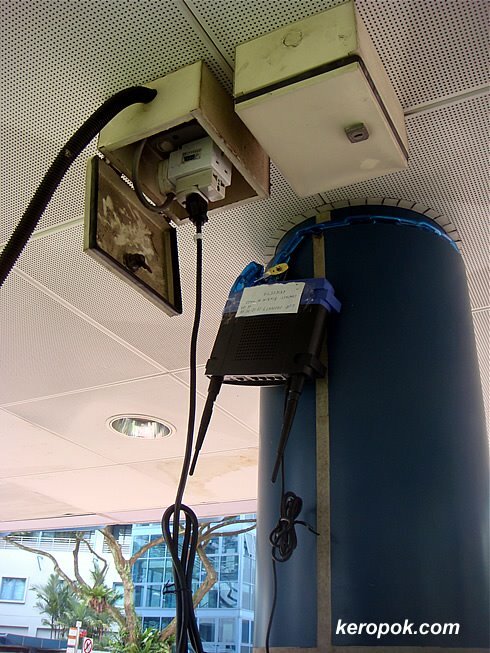 That's a Cisco (formerly Linksys) wireless router right? Why is it fix at the bus stop? There's even a big chain too. These tree roots are strong! 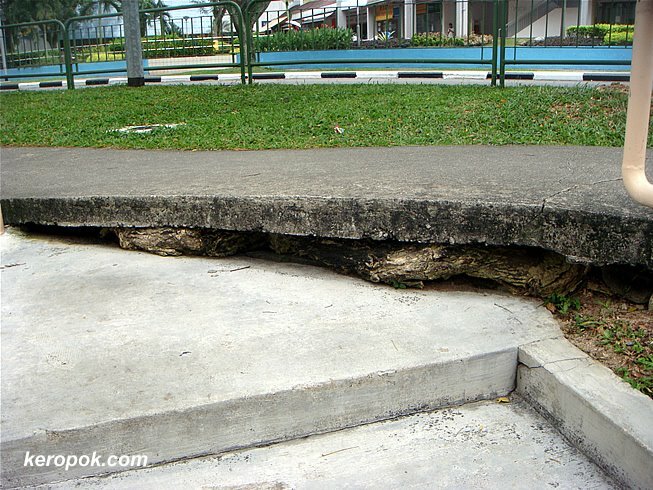 It has lifted up part of the cement walkway. 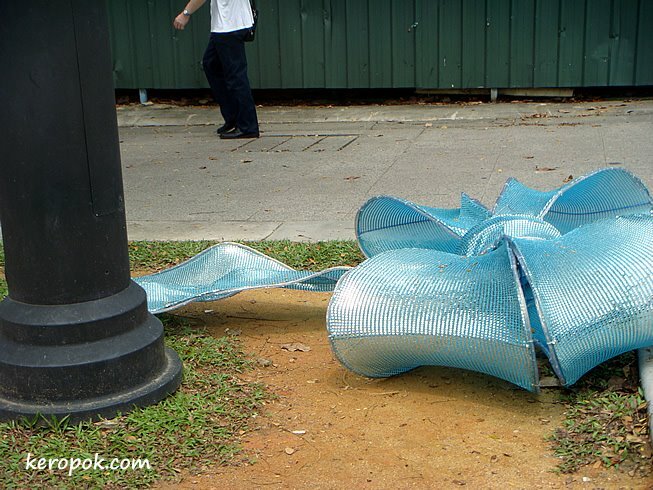 From far, I thought it was a snake or big reptile under it. LOL.. 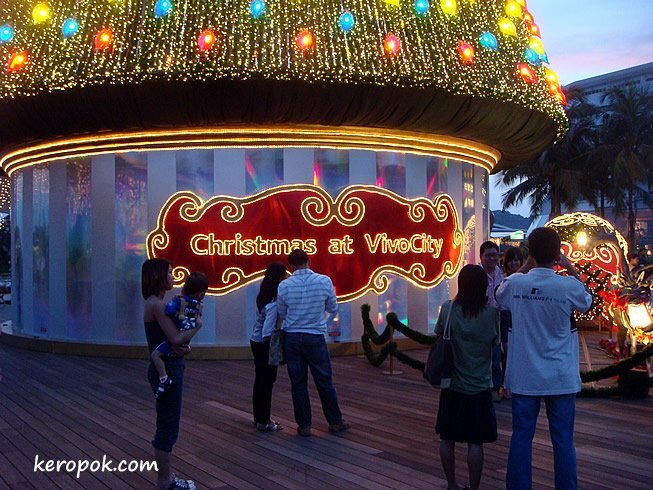 I have been so busy, I have not gone to view the Christmas lights at Orchard Road. Momo took this photo earlier when she was in her parents car. It's always nice to view bright colourful lights ya? 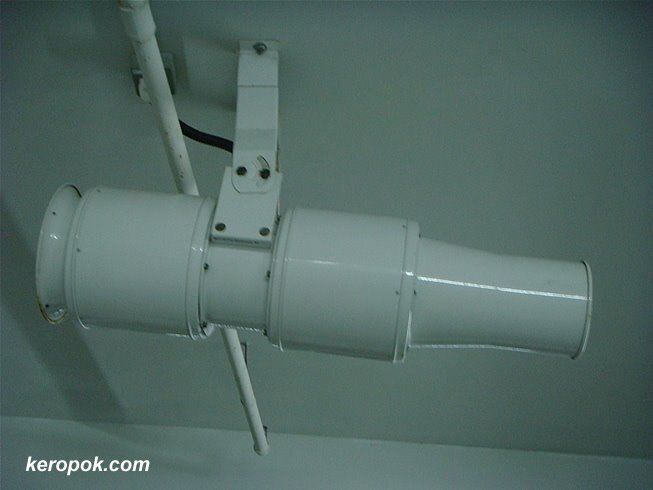 Looks like a big monstrous hair dryer don't you think? Many car parks seems to be using this now, depending on the design of the car park. I call it the hair dryer type air circulator. 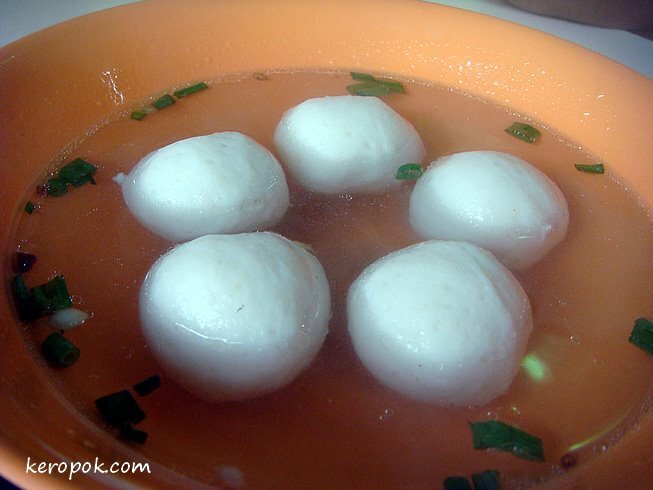 Do you know the name of it? Today a whole group of us attended our friend's wedding. Congratulations B and L! You all made a great couple. 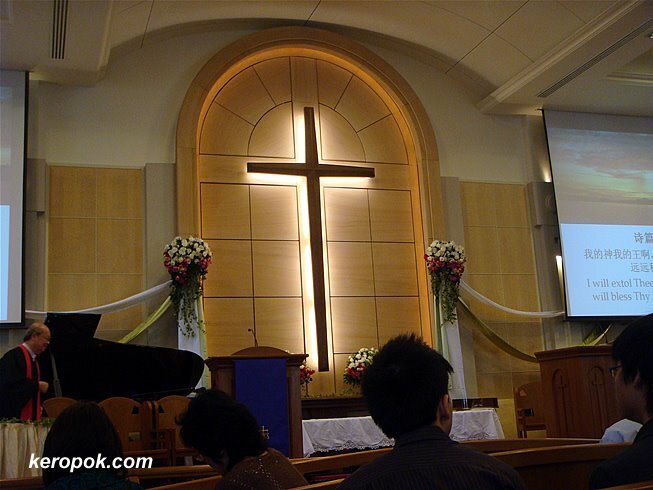 The wedding was at Telok Ayer Chinese Methodist Church. 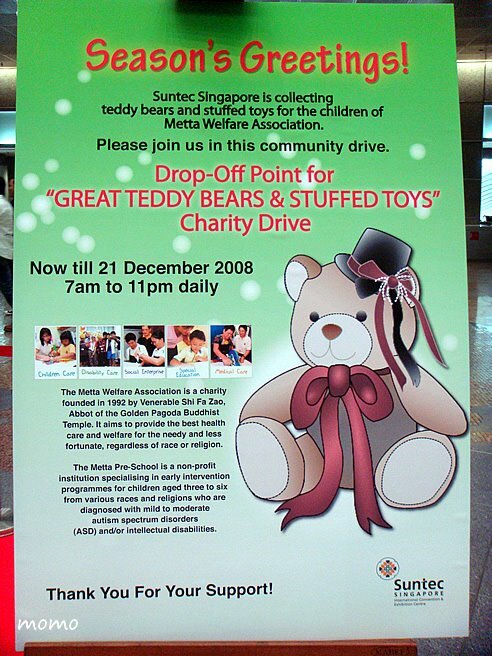 (TA2) at Wishart Road (Off Telok Belangah Road). We had a good laugh when a few people sms some in our group. "Is the wedding today? How come the church is closed?" Did they decide to cancel the wedding? I was at a recently refurbished shopping mall with colleagues for lunch. 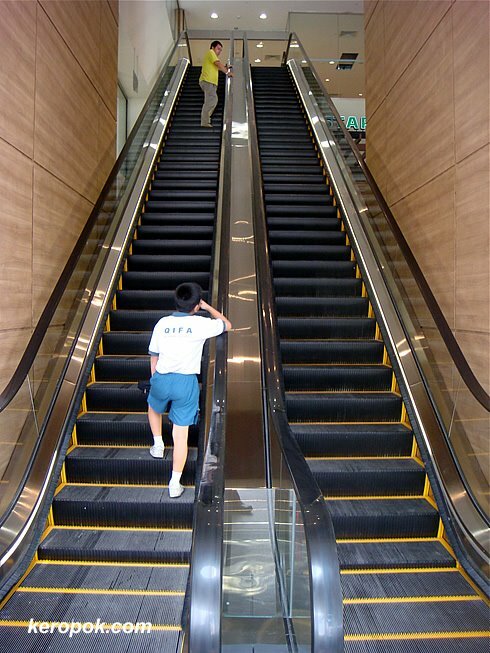 We saw that they now have escalators that directly goes up to the 2nd storey and also the 3rd storey from the 1st storey. (aka ground floor in many countries). 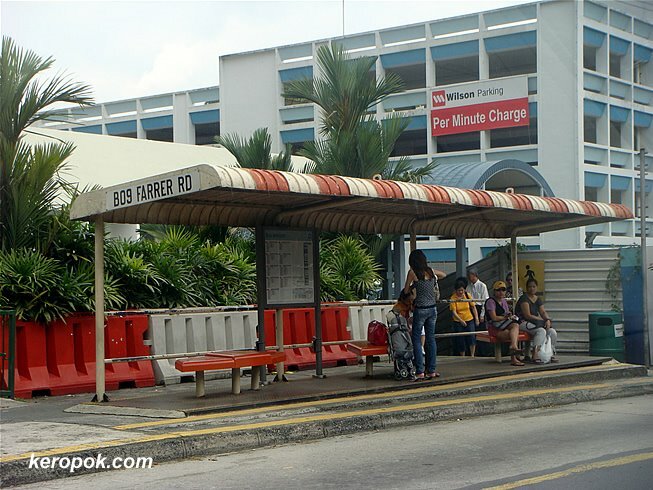 Long long ago, bus stops in Singapore looked like this. The bus stops no longer look like this. This is an exception, I guess because it's a temporary bus stop while there is roadworks around. A look at these men replacing the "big stickers" on the 'billboard' suddenly brings to mind: "What happened to all the stickers I collected when I was young?" I found the answer to the bus-stop ad I posted the other day. The trees gets more interesting every year. 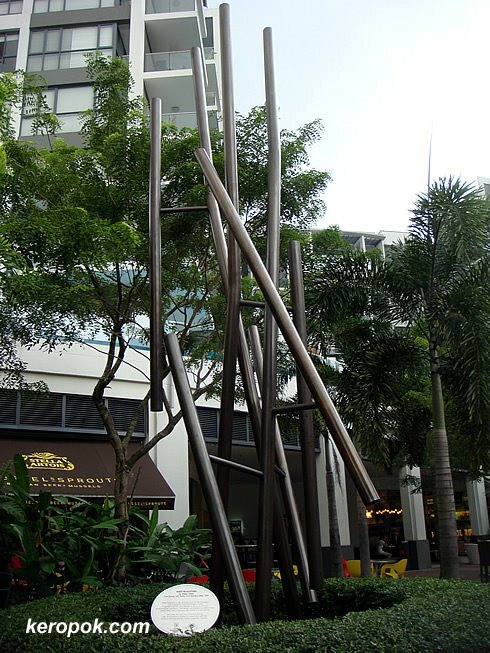 You heard of musical fountains that have lights and water displays that it in synch with the music. 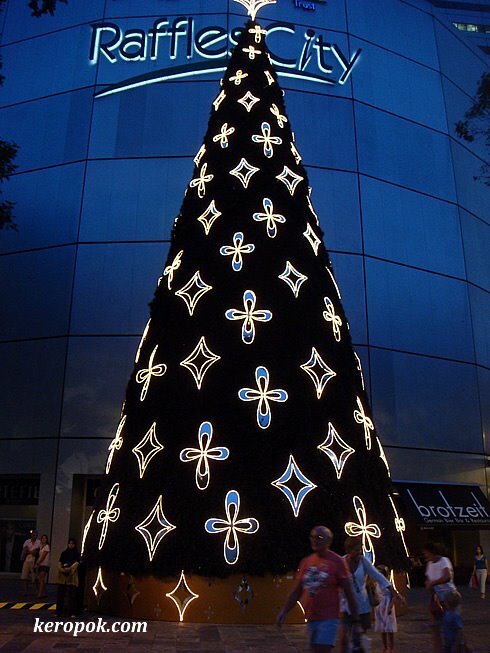 This tree at Raffles City shopping centre changes lights in synch with the Christmas carols too. 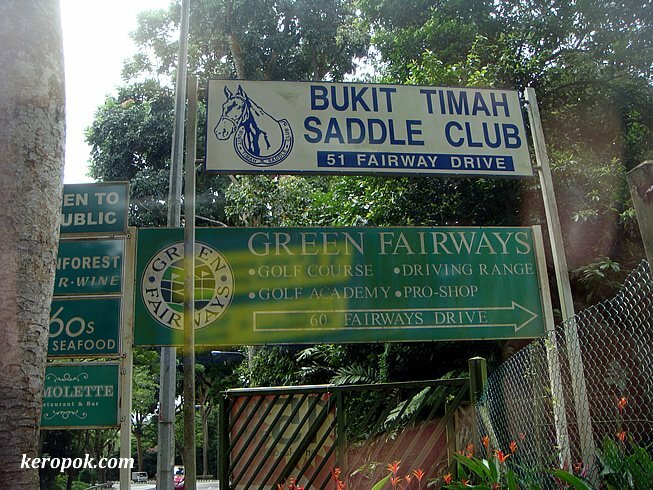 Someone brought me to lunch at the Bukit Timah Saddle Club. The moment you drive into this area, you might suddenly think you are in some country side where you see horses and lots of grass areas. Very peaceful place inside. Oh ya, there's a restaurant there called Riders Cafe that is quite unique. 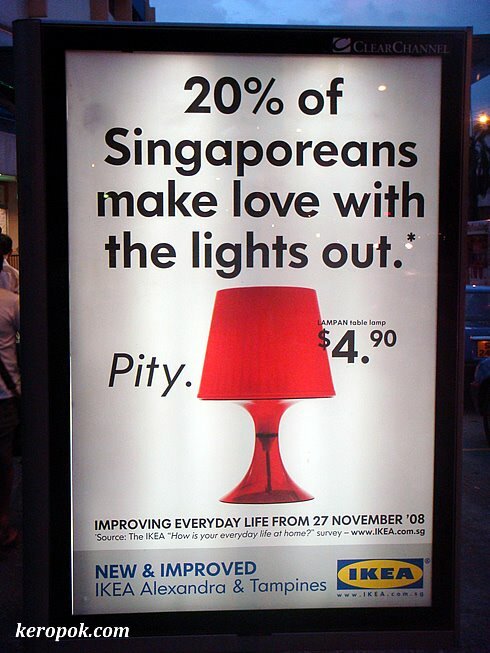 Well, walking home few days ago, I passed by an advert at the bus stop. I thought I would post it up, so here it is. Flooding on the roof top? 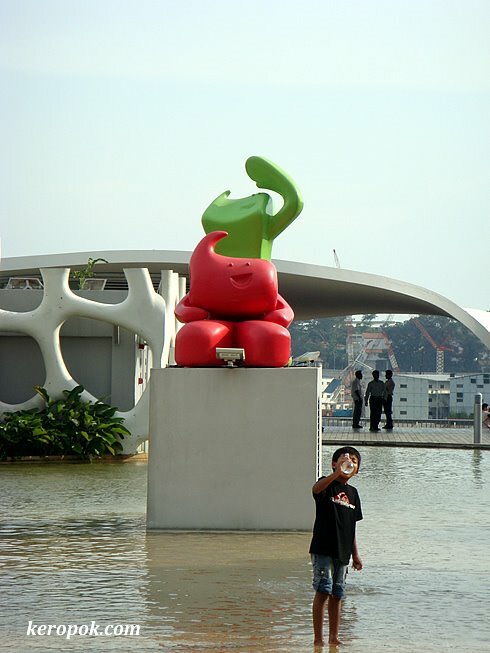 No, it's just a giant wadding pool on top of a shopping mall. It was raining quite heavily. The skies are dark. 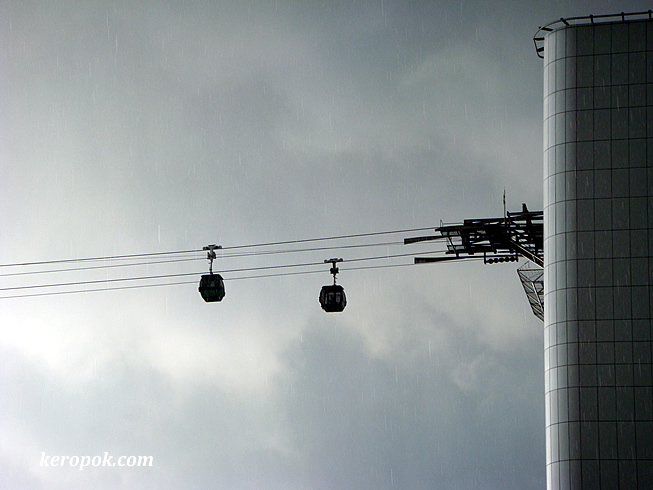 But the show must still go on... For those already in the cable car. The IKEA at Alexandra has got its new look. 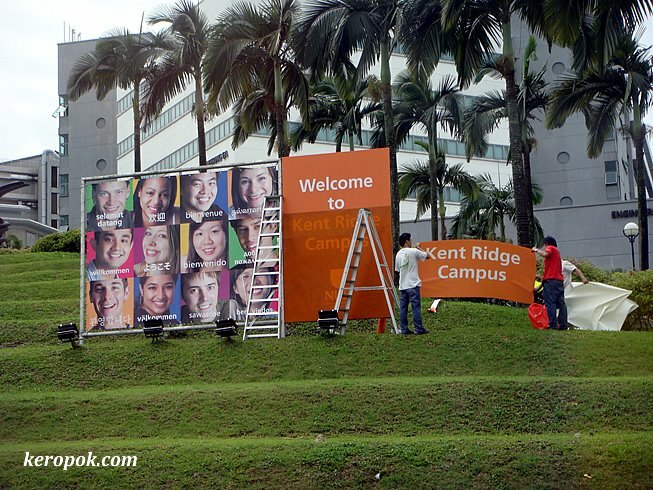 Have not been to this area for some time and the new look outside looks good. The interior's renovation has almost finished too. 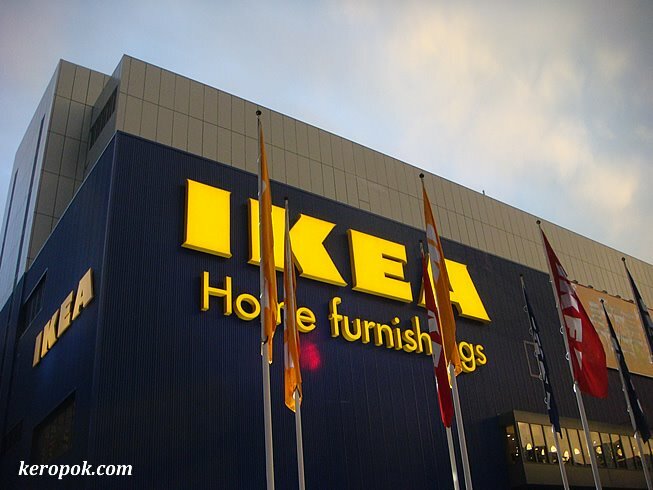 Was here to look for new furniture. Alkaff Bridge, the full bridge view. 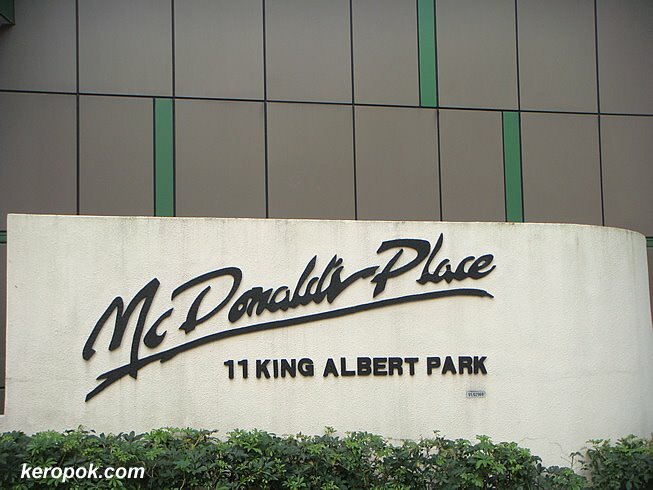 McDonald's Singapore Corporate HQ at King Albert Park. 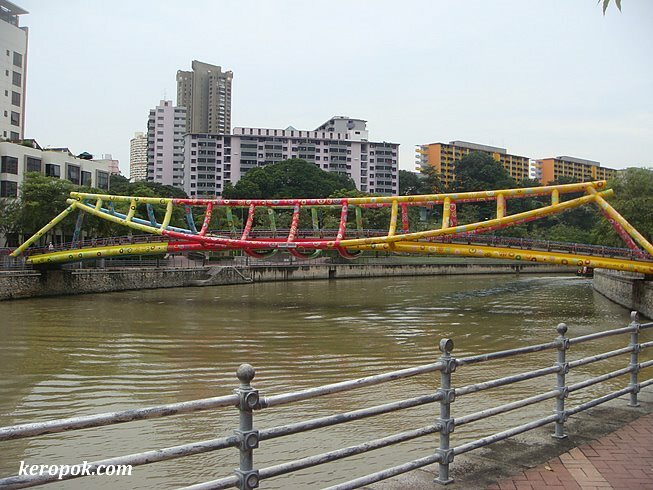 It has been wet and cold day in Singapore. It is as if 'Someone' up there has turned the tap on and wants to water the earth. 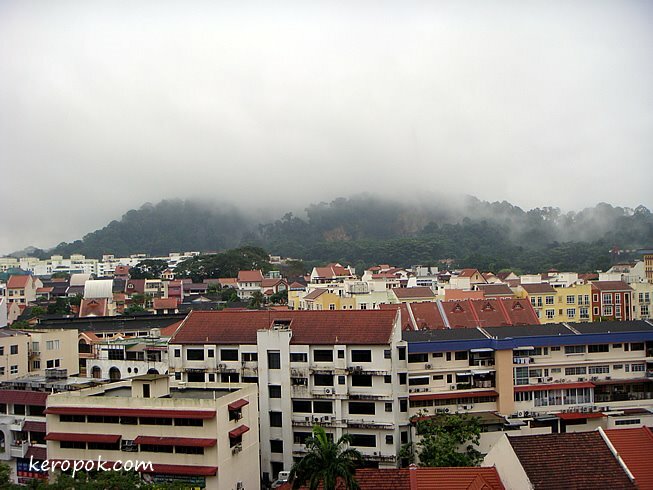 The tallest hill in Singapore - Bukit Timah seems to have grown taller. It has reached the clouds level from this photo taken this morning. The usual telecommunications tower is now hidden behind the clouds/mist/water vapor/whatever you call it.